Points Table following round 2 of the championship can be seen by clicking here. 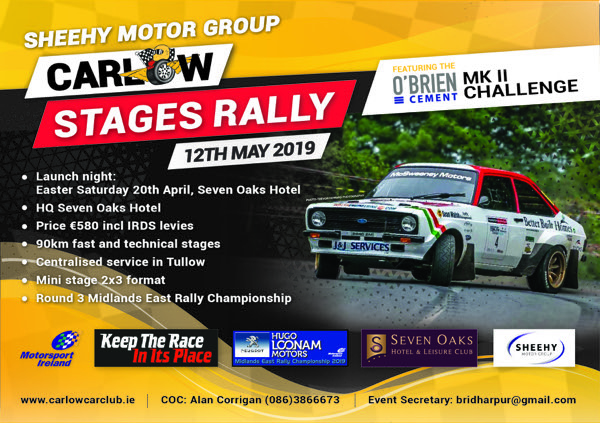 The Carlow Stages, Carlow, the 3rd round of the MERC Championship will take place on the 12th May 2019. Please see the files below or visit carlowcarclub.ie for more info. 24th February - Birr Stages Rally, Abbeyleix. 24th March - Midland Moto Stages, Longford. 9th June – Laois Heartlands Rally, Portlaoise. The Championship has always been geared towards the Clubman Competitor with all the events well spaced out and easy to budget for. The Championship comprises of 3 Multi Stage Rallies – Birr, Midland & Wexford along with 2 Mini Stage Rallies - Carlow & Laois. The Wexford 2 day will count as 2 Seperate days and points will be awarded for both days. The opening round of the Championship will be hosted by the Birr & District Motor Club based in the Manor Hotel in Abbeyleix on Sunday 24th February. This Rally is also the opening round of the Triton Showers National & Top Part West Coast Rally Championships. Further details on the championship can obtained from the Championship Registrar Eoin Longworth 086 8179297 or PRO Dawn Popham 085 7146732. Copyright © Raymond Scullion 2016.